Kostenlose Orthopädische Ressourcen – oreme - Europe's first Regenexx Clinic. Next-Generation Orthopedic Regenerative Medicine. Written by Dr. Chris Centeno, this e-book delves into the human musculoskeletal system and explains how everything works together in concert to maintain our physical wellbeing. When a single component in this chain is damaged, it can lead to a cascade of joint, spine and connective tissue problems, resulting in chronic pain. Using the Regenexx SANS approach, Orthopedics 2.0 walks you through a series of tests and exercises that you can do on your own to better understand where your own body is struggling to maintain proper stability and alignment, explaining the possible reasons and long term implications along the way. Orthopedics 2.0 also explores how Regenexx is pioneering the new field of Interventional Orthopedics, where the use of regenerative biologic treatments, such as adult stem cell therapy and platelet rich plasma, are being used to help repair and strengthen damaged tissues, as opposed to invasive surgeries that often remove important tissues when a joint or the spine becomes damaged. With hyperlinks to more detailed information, related studies and commentary, this book condenses a vast amount of data and resources into an enjoyable and entertaining read. 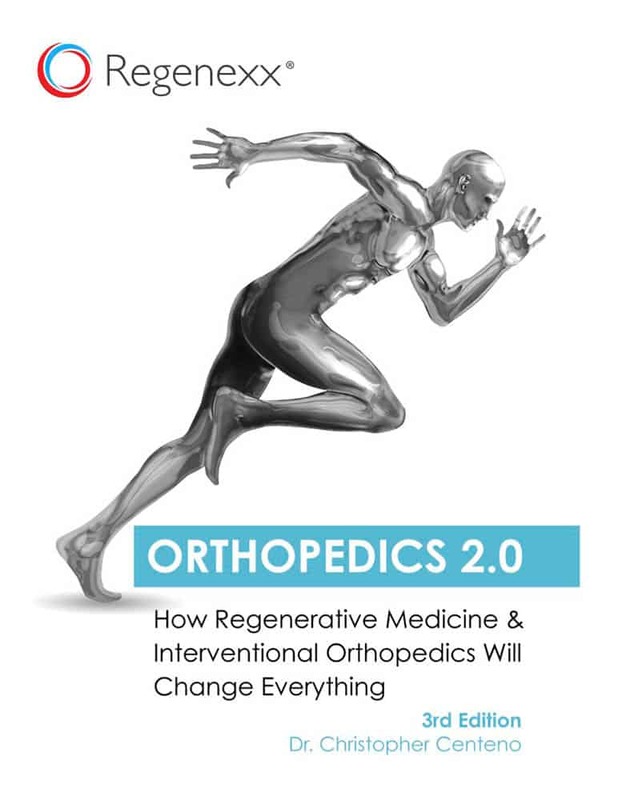 This is the third edition of Orthopedics 2.0 with even more content and graphics. Dieses Buch in englischer Sprache beschreibt den menschlichen Körper als Ganzes, die Aufgaben und das Zusammenspiel zwischen dem Knie und dem Bewegungsapparat. Mit Hilfe des Regenexx-SANS-Ansatzes (Stability, Articulation, Neuromuscular, and Symmetry) haben Sie die Möglichkeit, mit einfachen Tests und klar definierten Übungen den gesundheitlichen Zustand Ihres Knies zu überwachen. Lesen Sie in diesem Buch unter anderem, wie Regenexx-Pionierarbeit auf dem Gebiet der interventionellen Orthopädie und der regenerativen natürlichen Behandlungen leistet. Zu diesen Behandlungen gehören z.B. die adulte Stammzellen-Therapie und die Therapie mit plättchenreichem Plasma. Diese Verfahren helfen beschädigtes Gewebe am Bewegungsapparat zu reparieren. Dies steht im Gegensatz zu invasiven Knieoperationen, bei denen nach Beschädigungen oft wichtige Gewebe entfernt oder das gesamte Knie selbst ersetzt wird. Mit Hyperlinks zu detaillierteren Informationen, verwandten Studien und Kommentaren verdichtet dieses Buch eine große Menge an Daten, Bildern und Ressourcen zu einer leicht lesbaren und informativen Lektüre. 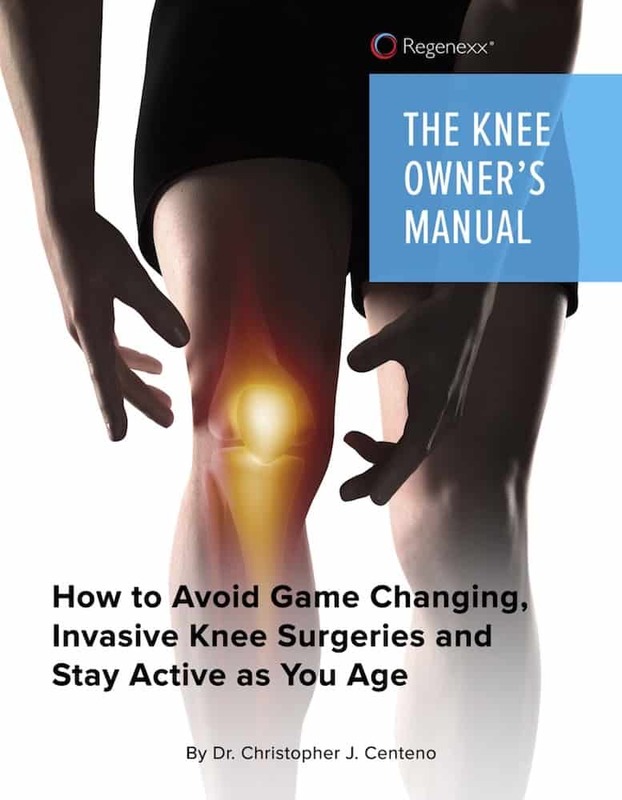 Dies ist die erste Ausgabe von “The Knee Owner’s Manual”, ein Begleitbuch zu “Orthopedics 2.0”. 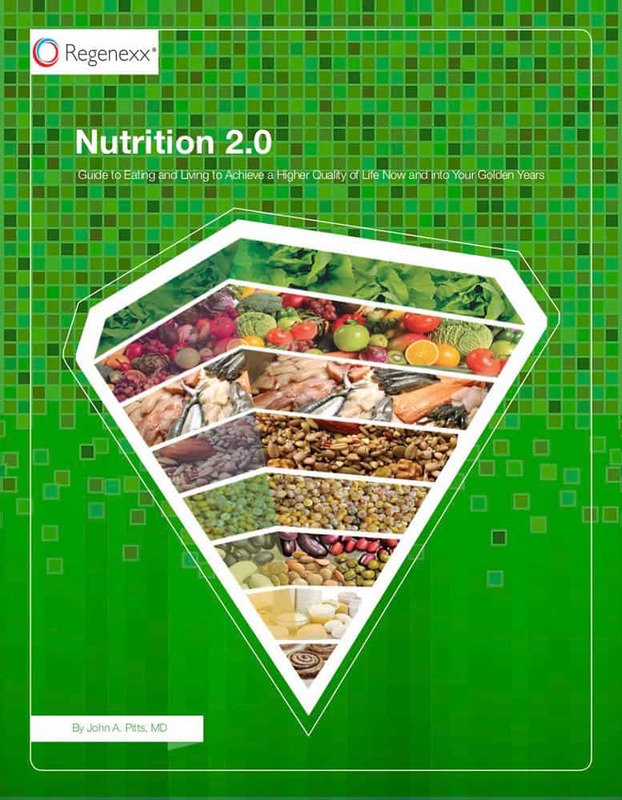 Nutrition 2.0 is a concise guide to eating and living healthy, written by Regenexx regenerative medicine doctor, John Pitts. The book gives a basic foundation of information on mostly diet, but also supplements, physical activity, and stress-relief to improve your life. It explains complex topics in simple terms. The book reveals the negative effects of sugar and high glycemic index carbohydrates and differentiates between “good” and “bad” sources of protein and fats. Dr. Pitts’ food pyramid is a much needed update to the outdated food pyramid the FDA recommends. This book also dispels common nutrition myths, discusses some common supplements, and gives practical advice on how to obtain an appropriate amount of physical activity. Following the suggestions given in the guide can help you feel and look younger, prevent and supplement treatment of chronic diseases, maintain an active lifestyle, plus help you lose weight in a healthy way and keep it off. This guide is not a magic formula or quick fix program that will suddenly cure all your ailments. Nutrition 2.0 teaches you simple measures that you can implement into your daily life that require some adjustment, commitment, and dedication, but will provide a lifetime of results. As we grow older, our body begins to send us warning messages. When these messages are ignored, small musculoskeletal problems can spiral out of control and leave us sidelined from doing the activities we love. And left untreated, these issues may lead to more chronic conditions and may permanently reset what we consider to be our normal level of fitness, performance or activity. This is why some people in their 70’s can run a marathon, while others in their 50’s can barely walk a mile. The Regenexx ProActive program provides practical advice on understanding these warning signs and taking action to maintain peak performance through middle-age and beyond. 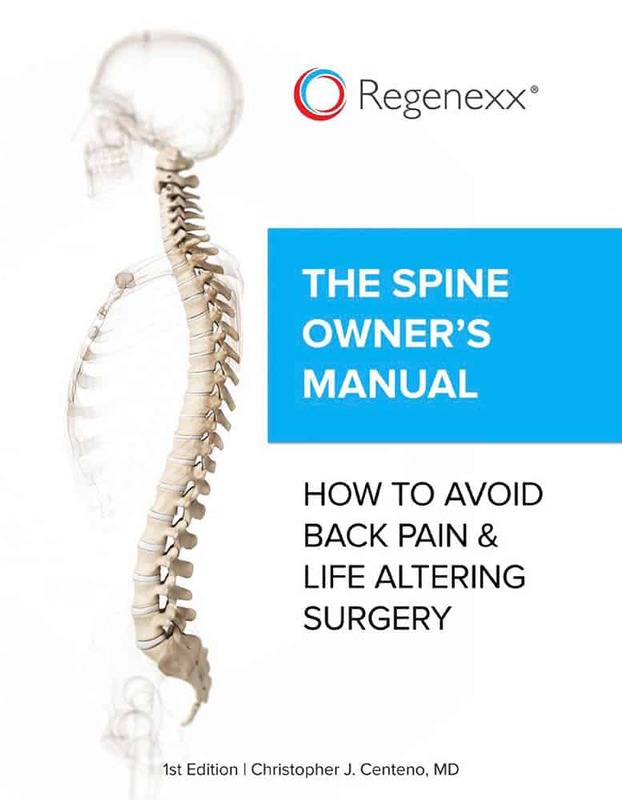 ProActive explains how the use of biologic treatments, such as stem cells and blood platelet procedures, can help return joints and the spine to a healthy state before things go awry, ensuring that small problems don’t go from bad to worse. 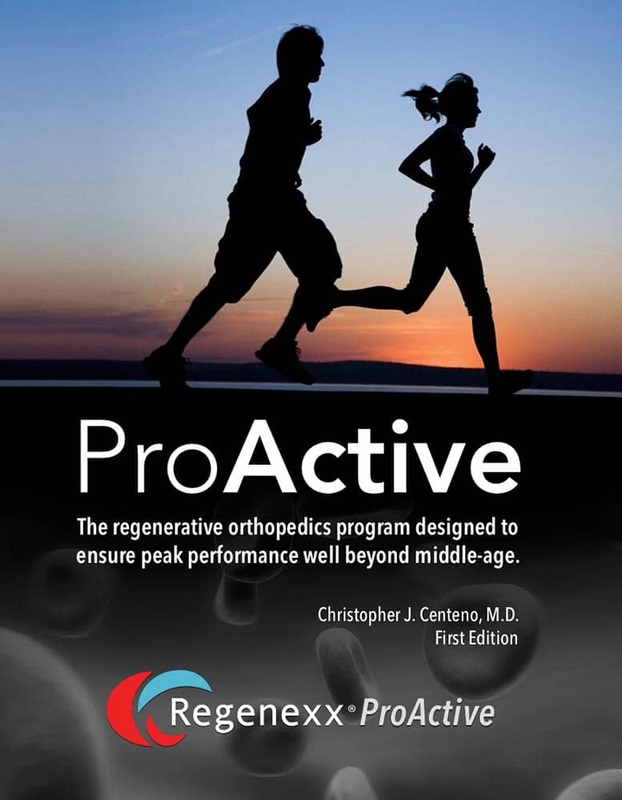 Written by Dr. Chris Centeno, ProActive includes hyperlinks to more detailed information and related research that supports the Regenexx ProActive program’s approach to maintaining health, fitness and well-being throughout our middle and later years of life.